Water gives us life and we all know how good it feels to quench our thirst with a nice tall glass of cool water. But is cool water always the best option? Or maybe there are occasions where we should opt for warm water? Some experts speculate on what the best water temperature is to achieve optimal hydration. After all, our internal body temperature is 37.0 °C (98.6 °F) which is vastly different from that of a glass of cool water. Ancient medicine systems such as Ayurveda, which originated in India more than 3,000 years ago and Traditional Chinese Medicine (TCM) both highlight the importance of temperature and its effects on the body. So it seems that there are certain occasions where warm water is more appropriate than cold! Whether cold or warm water – the most important thing is to stay hydrated and listen to your body. Our bodies have their own innate intelligence and often tell us what we need to know. When you’re working out or the weather is hot outside, you’ll likely crave ice water. But when you’re sick with a cold you will be more inclined to want hot water. It’s still good to know the science behind the best times for cold vs. warm water! During exercise the core body temperature becomes elevated. Sweating is one mechanism that our bodies use to cool down, but we lose a lot of water and electrolytes which need to be replenished. Sipping on cold water during a workout both rehydrates the body of lost water and helps to cool down the core body temperature. A study done in the Journal of the International Society of Sports Nutrition compared room temperature water and cold water during workouts. Researchers found participants who consumed cold water were able to keep their core temperature down 50% longer than the group consuming room temperature water (1). Drinking cold water when you have a fever is one method of cooling the body down. It’s important to keep super hydrated when you have a fever because you’re body is working hard to get rid of whatever foreign invaders may be causing you harm. When you’re overheated, drinking cold water can be a huge relief. Try squeezing some fresh lemon and adding a pinch of sea salt to help replenish lost electrolytes. Drinking cold water has been shown to boost metabolism and help burn an additional 70 calories per day (2, 3). Though it’s no miracle obesity cure, it does add up over time. When you consider that a person of average weight (155 lbs) burns 70 calories going for a 15 minute walk, ice water starts to sound like a pretty simple and effective way to burn extra calories when you’re trying to lose weight. Further reading: read my article about 12 simple tweaks for weight loss and great health. Ever wonder why most people consume a hot beverage upon rising? Yes caffeine has something to do with it, but that’s not the only reason. Ayurvedic medicine states that drinking warm water in the morning helps to stimulate digestion. to know for those of us suffering from digestive distress! Further reading: read more about the benefits of drinking warm lemon water in the morning. This requires the least amount of energy for your body to assimilate. The lemon also helps to stimulate digestion and flush toxins. During a detox you may want to add some cleansing additions to your water. Find here how to easily make your own flavored water for detox and weight loss. Not only will you find keeping hydrated more enjoyable, you’ll also be receiving the cleansing benefits these foods have to offer. Further reading: To learn more about the concept of detox and how to use detox to cleanse and energize your body, you can find a lot of useful information in my e-book The Detox Guide. This guide provides the best information and safe ways to detox, including recipe ideas. 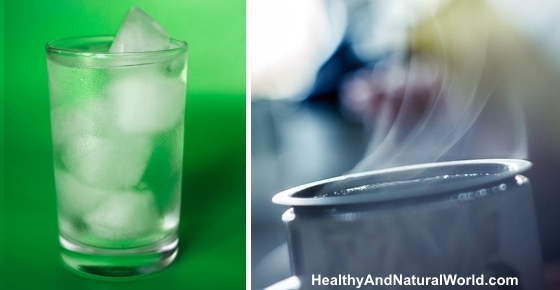 Warm or hot water is better to consume if you are dealing with a headache or inflammation. Because warm water helps stimulate blood flow to the tissues it’s an excellent remedy for treating menstrual cramps (6). Further reading: read my article about the top 22 painkillers in your kitchen. Drinking warm water when you’re constipated can help to move things along. The main cause of constipation is dehydration, so it’s essential to consume extra amounts of liquids. Warm water helps to stimulate blood flow and has a more soothing effect in the intestines than cold water. Further reading: Find here more effective natural remedies for constipation. Traditional Chinese Medicine (TCM) doctors have advised against drinking cold water for thousands of years. The logic behind this premise is that cold water has the overall effect of contracting, slowing and shrinking. Warm water helps to keep everything fluid, protects the internal organs and increases healthy blood flow and circulation. Ayurveda has a similar stand point and doesn’t recommend cold water for the same reasons. Keep in mind these are very old systems of medicine. When these systems were put in place, people weren’t typically worried about losing weight. They were more concerned about how to preserve energy. However, in most cases these ancient medicine systems are time tested and have withstood the medical trends that we see come and go. In regards to healthy digestion and maintaining high energy levels it is probably better to drink room temperature or warm water. Aside from the circumstances listed above, the consensus from a broad spectrum of health professionals is to stick with room temperature water. Always take into the consideration what the temperature is outside. On a hot day, drink cold water, on a cold winter morning you will probably want to opt for hot or warm water. Drinking warm water in the morning is a great way to stimulate digestion and get the blood flowing to increase energy, and it’s also detoxifying. Adding citrus or herbs to your water can make it more enjoyable if you don’t like the taste. Many people stick to cold water because it tastes better, but room temperature water can be just as enjoyable. Remember to listen to your body, often it is the best health authority. Thank you for sharing this informative piece of knowledge. I read few years back that drinking Hot water with lemon and honey first thing in the morning and would like to share that it is very beneficial for your skin and loosing weight. Actually, water is made from H2O whether it is warm or cold. Generally, drinking water has some other particles in it in very low concentrations. Heating it up does not reduce those particles, unless the particles are bacteria which are killed by heat. I think cold water is more better than warm water, because when you warm water a lot of elements are lost which is present in the water. dude we are not boiling water. just drink luke warm water thats it. Thousands of years ago I’m sure it would’ve been very difficult to have cold water, which is probably why they advocated warm and hot water to be better. Wow, the reason to drink hot/warm water is about sanitation, because there are lots of bacteria inside the water in the ancient time, and we had no machines to purify water in that time, the best way to kill those harmful bacteria is boiling the water, useful minerals are preserved. It’s way better to drink cold water especially in the summer , it helps to keep your core body temperature from rising to hot , and study’s have shown dogs drink more water when it is chilled than room temperature , and cold has less chemicals than warm , warm water makes you want to throw up especially when it’s hot out Rev 3 : 16 [Niv] bible . Just reason it, cold is way more refreshing than warm , and we are not saying ice cold , that is completely different , ice cold is dangerous, especially when it’s hot , it can arrest the heart muscle . The one who made our bodies agrees with the above points Pr 25 : 25 Matt 10 : 42 Niv bible, and Mk 9 : 41 Niv bible . All these comments are contradictory.. Then what is actual conclusion..? The conclusion is in the article itself – there are case where cold water is better and vice versa. There is no contradiction. I am kind of surprised that drinking cold water can be beneficial after exercising etc. I have always been told that warm water is best for me and that cold water makes my body work too much. So, I’m glad you explained the benefits of both. I will no longer feel bad about getting a cold drink from the fridge at the gas station. Cold or ROOM Temperature Water is better than hot or warm water. In old days it was difficult for the people to get the clean and purified water therefore they used to heat it up to make it clean. But now a days purified water is available and you can drink chilled water with all minerals in it, instead of boiling it and wasting all the minerals…. Room temperature water is best. By doing this one thing you can decide which is better all by yourselves. When suffering from acidity or digestion problem, drink lukewarm water. Next time try cold water on same issue. You will notice the difference. Water is the most crucial facilitator of life. All cells must have sufficient water to perform their functions. The space between the cells must also contain enough water to feed the cells. Scientifically, the best kind of water for life is the one that posseses a large amount of hexagon molecules. Because that is the same kind of most good water in human blood. Cold water at 4c has 25% more hexagon molecule than water at room temperature, at 0c the hexagon increases to 27%, and reaches 100% at -35c…!!!! Now, you can figure out whether cold or warm water is better for your body, in spite of all this controversy. I suggest if you prefer cold to warm water, please drink it slowly and at a small amount each time. Dr. Seung Nam Lee “How to live 10 more years with water”, 2015, LEECOM Pub. Group. With all that being said. No matter if your drinking cold or hot water it is ok. AS LONG AS YOUR GETTING WATER IN YOUR SYSTEM WHICH IS THE KEY FACTOR!!! NOT ONE IS BETTER THAN THE OTHER. Just keep your body hydrated!!!!!!! !